The Benefits of Smart Home Automation for Vacation Guests, Property Managers, and Homeowners. This post comes to us from Sam Radbil, an author at ABODO Apartments, an apartment marketplace website that makes apartment hunting easier for people all across the country. You can check out their available apartments in Chicago, IL and follow along on Twitter at @ABODOapts. Smart home automation is a win for all parties involved. Whether you’re an owner of a property management company, a vacation property guest or a first-time home buyer, you can benefit from the most innovative smart home technology available for the place you, or your guests, relax each night. In 2018, you can hardly do anything without seeing some type of smart home technology. Companies all over the world are working hard to create the most innovative tech that turns your living experience into a truly convenient, peaceful and worry-free environment. The fact of the matter is that smart home tech is making a major impact on the real estate industry and there is no reason not to embrace it. Let’s start with those who call themselves homeowners. Studies show that 81 percent of buyers prefer homes with at least some type of smart technology included. To start, we know buyers are willing to pay more for smart homes — but what are they getting? Buyers who purchase homes with smart technology included will find awesome features such as network-connected thermostats, truly enhanced security systems, lighting automation, entertainment automation and even smart refrigerators, washers and dryers. All of these automated accessories turn a normal home into a home with improved energy efficiency, privacy and make the home much safer and enjoyable to live in. Homeowners who previously controlled all aspects of their home manually are now able to command many aspects of their home with a simple voice prompt. Even better, homeowners who take full advantage of smart technology can automate exterior features as well, including smart outdoor plant sensors and watering systems and patio and yard lighting. A homeowner in 2018 can also increase the value of their home significantly by implementing smart home technology. The technology exists, so why wait? Imagine this: you arrive at your vacation rental and you’re ready for a full week away from the office with your family. You finally get to your destination after a long day of travel and you’re ready to unpack, unwind and relax. But wait, you can’t get in? The owner forgot to leave you the key and now you’re stuck renting a hotel down the block. This is where smart technology can save the day: keyless entry. Not only does keyless entry provide increased security for the property, but it also allows vacation rental managers to remotely monitor the unit while letting the guest enter freely without the hassle of a physical key. Guests will undoubtedly prefer keyless entry, and managers of the property will find that time and money are saved on extra keys and lock updates. While the guest will be exponentially happier with the keyless entry, the owner will benefit in another very important way as well — increased rental rates. Travelers expect accommodations to be incredible. They want convenience and peace of mind when they start planning a vacation. With smart technology in place, vacation rental managers can increase the day-to-day rental fee, because of the far superior rental experience. And after all, isn’t that what we pay for when we vacation … the tremendous experience? You’ll provide an amazing experience for your guests with the addition of smart home technology. Give them the satisfaction of voice-controlled music and television, keyless entry and smart thermostats. It will pay off in a huge way. What about Property Management Companies? Smart home technology isn’t just made for the single-family homeowner. Multifamily builders and property management companies are taking full advantage of the technology available today. It would be extremely wise for all managers to consider the full range of benefits and offer these features when developing a property. Smart home products are often considered a “luxury” for apartment residents, but soon they’ll be the norm. Whether you manage a luxury Chicago apartment or an affordable housing complex in Minneapolis, you’ll find benefits from implementing new technology. So, what are the benefits? The primary goal is the create a seamless and convenient lifestyle for tenants. Residents want utility savings that come with using smart home thermostats. They also prefer the increasing availability of Bluetooth options as well as smart-key entry. If you, as a property management company or multifamily builder, can implement a few basic smart home technology accommodations, it will lead to a decrease in the vacancy rate in the near future. Along with implementing new features and accommodations, smart home centralization is extremely helpful in providing maintenance and care for your residents. The ability to control a thermostat or lighting system for a resident who forgot to turn their lights off before a long vacation can help save the resident a handful of cash. They will truly appreciate this and value your help in a big way. Integrated platforms can also provide flexibility for the common spaces in an apartment building—control the entryway, patio and business center lighting with just the click of a button. This will make things much easier for all your property management employees. Consolidating everything into one main control area is a huge benefit. 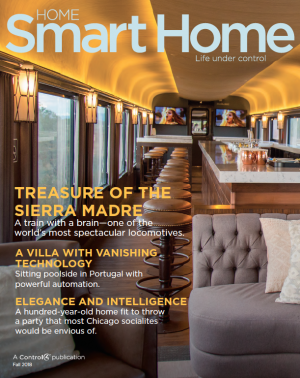 Interested in living the smart life in a Control4 smart home? Simply fill out the form below and we’ll be in touch.